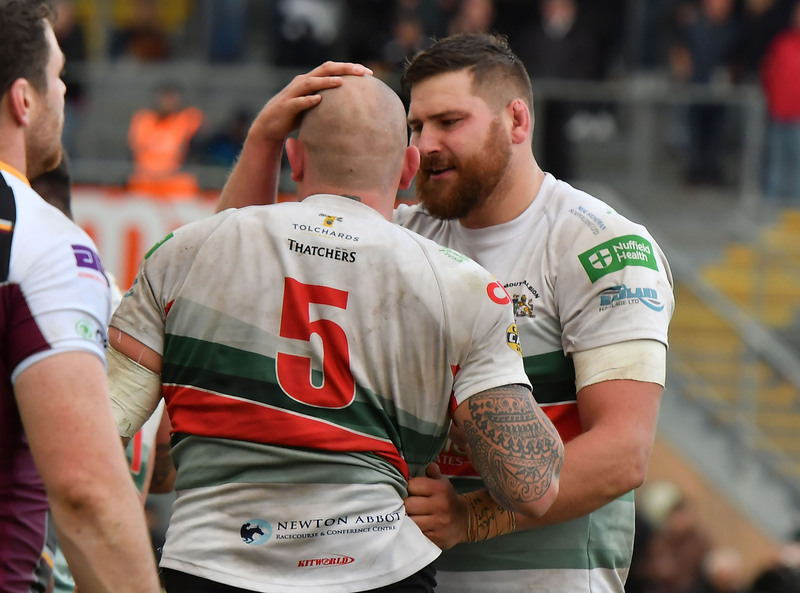 Plymouth Albion showed their power Saturday, in a bonus point statement victory over National league one table toppers Caldy, winning 24-14 at Brickfields. For the duration of the game Albion were in charge and seemed to be the only side on the park as Caldy did little to pose a threat and live up to their own early season success. “We’ve spoken a lot in the past few weeks and put pressure on our game managers to manage the game better and make better decisions, and today I think we saw that come through. “We’ve put a lot of time into improving our discipline and I think there was a massive improvement in that today, there were still a couple of mistakes at the end when we were under pressure a little bit, but otherwise, I think we were very much improved. “We were very comfortable in that game, when we scored that fourth try it kind of put the game to rest and yeah they came out throwing everything around and loose, but actually we dealt with it pretty well. “We spoke about it at half time, we’ve been really dominant, had a lot of territory and done some really good things but it hasn’t quite translated on to the score board. “It’s really good for my hundredth game, at the end of the day it was an outstanding performance from the boys and for myself playing the full 80 minutes. “The side has been coming along well, obviously there’s been some talent lost to professional clubs, Billy Searle has gone to Wasps, Robin Wedlake to the Pirates, so it shows that the younger boys are coming through, and it’s nice to see them move on. Straight from the first blow of the whistle, Albion played aggressive rugby to stun their counterparts. In no more than two minutes, Albion were at the try line rolling through the phases in the hunt for a try which came a minute later, with the quick ball put out wide for Dan Powell to score an unconverted try. With a start that was Vitaly needed for Hallett’s men, Albion continued to dictate the game throughout the first 20 minutes, but for all the possession and pitch positioning, the city side were held scoreless by a good Caldy defence coupled with bouts of bad handling in crucial areas. Eventually, Albion were able to add more points to the pot with yet another attacking set piece. Using a Caldy penalty to set themselves within five metres, Albion mauled well to go over almost unopposed, a feat which unusually seemed easy after the Caldy’s blockade held strong for so long. The try was set down by Paul Davis, but the conversion was missed once again, playing into a strong wind. Rather comically, Caldy scored with one touch from the ensuing kick-off, using an Albion mistake to piggy back themselves into the game with a Nicholas Royle try which took no more than 10 seconds from conception to completion, and, with the wind advantage, Caldy’s Benjamin Jones added the extras. With the quick fire score, Albion were kept humble despite holding complete dominance through the first half. Both the teams would retreat to the warmth of the locker room with the score 10-7 Albion’s way. Matters began to get trickier for the visitors in the opening 10 minutes of the second half as the side lost Harrison Crowe to the bin, for playing offside on his own try line. The superior power of Albion licked their lips at the man advantage and extended their lead accordingly with two quick succession tries from George Mills and John Dawe. With the wind now at his back, Honey found his mark, converting both tries. Trailing 24-7, Caldy finally found their feet at the hour mark to see Nick Royal go over for his second score, which coupled with a nice converted kick, kept the visitors chasing. With scrappy play beginning to creep into both squads, referee Jack Lewars used his cards to calm the game, issuing a yellow card to Caldy’s Ted Stagg and Albion’s Jack Arnott, after a large tussle broke out at the half way line. Still holding a two-score lead, Albion began to play with more caution, which allowed Caldy to have their own first real look at the ball the whole game, and they began to show some signs of life, but it was too little, too late. With both sides restored to full strength, play was contained to the half way line, allowing Albion to seal out their second home win of 2018.